Some years, March comes in like a lion, the winds shake the trees and storms sweep across from the Atlantic bringing heavy rain. This may seem unpleasant but is necessary as this is the prime planting season for the west coast. There is a window of opportunity, between the dry grey days of winter and the bright sunny spring when the ground is warming up and is damp, if not wet, and time is ripe for planting. Miss this window and we often find it turns dry and much time is wasted carrying buckets of water to newly planted trees and shrubs. We are lucky to have few late frosts, not unknown but rare from mid March and most of the Glorious Gardens open to the public by Easter or the beginning of April, whichever is earliest, so March is a busy month tidying up the gardens and preparing for the coming year by top dressing beds, raking paths and clearing out the pond and burn of winter debris. 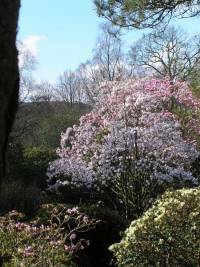 In the Glorious Gardens woodland gardens, it is often amazing how much is in flower. Species rhododendrons such as R giganteum start in early March as do R sutchuenense and the strong reds of R striggilosum, hookeri, neriiflorum and piercei. So while snowdrops, snowflakes and early Lenten narcissus carpet the ground, there is already plenty of colour in the garden. 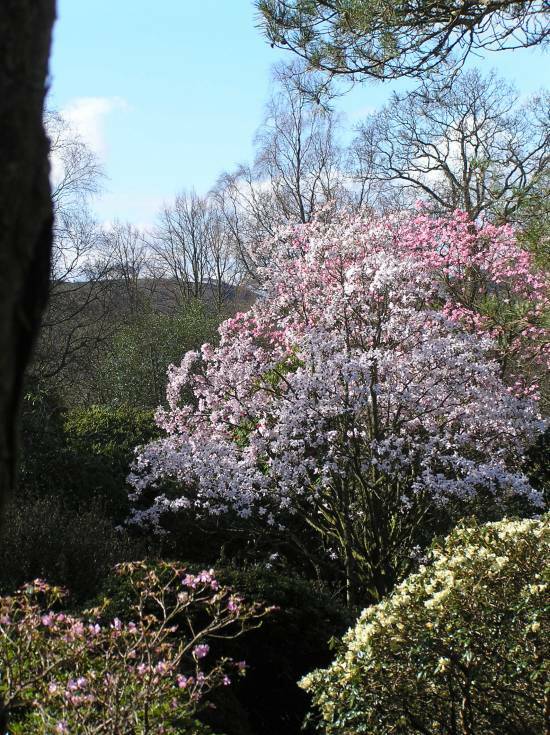 In addition, the tall Asiatic magnolias start towards the end of the month, depending on the temperature. These are amazing precocious flowers covering large trees up to 40 metres high, long before sign of the leaves. The effect in the garden is striking, like luminous beacons shining out. The flowers are white or pale pink for the most part but occasionally shocking pink or purple as in M sprengeri ‘Diva’. The magnolias bloom through April, with other smaller members of the genus following in May and June. 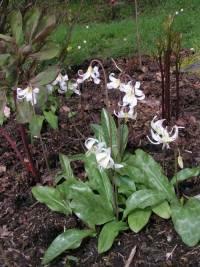 In the rock garden, tiny Erythronium dens-canis, the dog tooth violets appear briefly with strange mottled leaves and tiny lily-like flowers in purple or creamy white. The hellebores are filled out with Primula denticulata in shades of mauve and white and more narcissus start to appear, particularly species such as N cyclamineus with its dramatically swept back petals, like a cyclamen. In the wilder garden the short Lenten daffodil leads the way in clumps with butterbur and the foliage of Arum pictum providing contrast. As well as the scent of daphne, the tiny yellow flowers of Cornus mas appear and the pinky red buds of paeonias are poking through the soil only to be top dressed with compost to protect them. 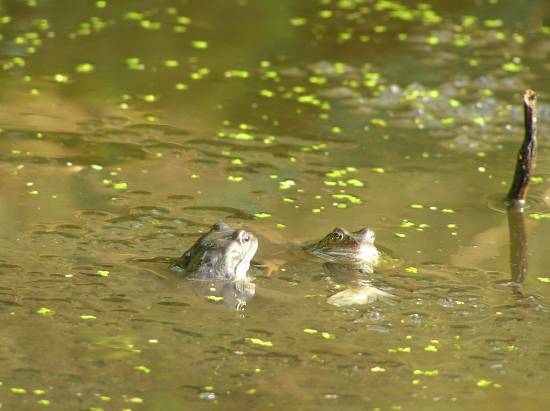 There may be a few days of colder weather but overall, the thermometer is rising, the birds are singing their hearts out and pairing up, the jackdaws are inspecting the chimney pots and the frogs are gathering for their great annual mating party in the pond.